Photographic reproduction of a print depicting Arthur St. Clair (1736-1818), who served as the territorial governor of the Northwest Territory from 1788 to 1802. St. Clair's Defeat was a major confrontation between the armed forces of the United States and the American Indians of the Northwest Territory. It was the worst defeat of the United States Army at the hands of Ohio's American Indians. To protect settlers and to force the American Indians to abide by the Treaty of Fort Harmar, Arthur St. Clair, the governor of the Northwest Territory, ordered the construction of forts in what is now western Ohio. St. Clair moved against the American Indians living near present-day Ft. Wayne Indiana, in September 1791. His men left Fort Washington, near Cincinnati, on September 17. The men marched twenty miles in two days and then built Fort Hamilton. St. Clair's army then advanced forty-five miles northward, where his men built Fort Jefferson. Leading primarily untrained militiamen, St. Clair faced problems with desertion from the beginning of his campaign. Although it was still early fall, his men faced cold temperatures, rain and snowfall. St. Clair also had a difficult time keeping his soldiers supplied with food. His men became demoralized. Despite these problems, St. Clair continued to advance against the Miami. By November 3, his men had arrived on the banks of the Wabash River, near some of the Miami villages. Little Turtle led his warriors against the Americans on the morning of November 4. Many of the militiamen under St. Clair immediately fled. St. Clair led the regular soldiers in a bayonet charge. St. Clair had two horses shot out from under him. Several bullets passed through his clothing and one took off a lock of his hair. The American Indians surrounded the American's camp. After three hours of fighting, the remaining U.S. soldiers fought their way out and began a lengthy retreat. The survivors reached Fort Jefferson late that afternoon and evening. With limited quantities of food and supplies at Fort Jefferson, St. Clair ordered his forces to Fort Washington. Of the 1,400 men who served under St. Clair, 623 soldiers were killed and another 258 wounded. One of the survivors stated, "The ground was literally covered with the dead." The American Indians had soundly defeated St. Clair's army. President George Washington demanded that St. Clair resign from the army. St. Clair did so on April 7, 1792, but remained governor of the Northwest Territory. He still faced problems with area American Indians. 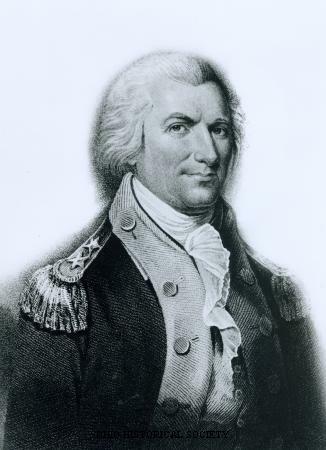 In 1794, Washington dispatched General Anthony Wayne to succeed where St. Clair had failed. Wayne defeated Ohio's American Indians at the Battle of Fallen Timbers in August 1794. In 1795, most American Indians in modern-day Ohio signed the Treaty of Greenville, relinquishing all of their land holdings in Ohio except what is now the northwestern corner of the state. Edel, Wilbur. Kekionga! : The Worst Defeat in the History of the U.S Army. Westport, CT: Praeger, 1997. Wilson, Frazer Ells. Arthur St. Clair, Rugged Ruler of the Old Northwest; An Epic of the American Frontier. Richmond, VA: Garrett and Massie, 1944.